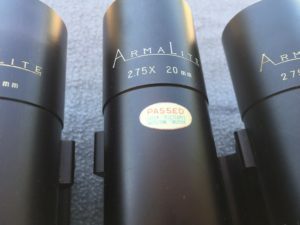 As I have collected more AR-180 scopes I have been able to note certain features and changes that occurred over the production run. Now that I have multiple scopes from each generation I felt I should expand on my earlier article. Lets look at the group so far. Here they are shown from left to right in order of production date. The three on the right are first generation, inverted post reticle, marked in meters, serial numbers starting in 67. 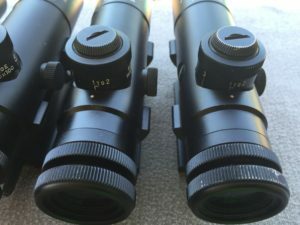 Scopes four and five are second generation, inverted post reticle, marked in yards, serial numbers starting in 71. The last two are third generation, cross-hair reticle, marked in yards, no serial number. The first thing that jumped out at me was the ArmaLite and power engravings. They appear to become thicker in the later scopes and the change happened during the second run of scopes. Those made in 1971. 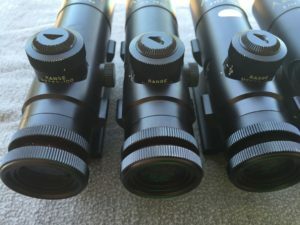 The first second gen scope is numbered 711201 and this scope has markings like the early, first gen scopes. 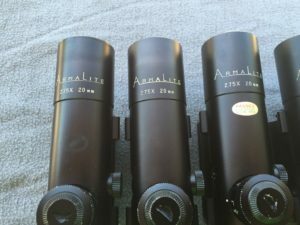 The second scope is numbered 712116 and has markings like the late, third gen scopes. Somewhere between these two scopes the change happened. If anyone has any scope numbered between these two I would like to know the serial number and style of marking. I think we can pin this down a little closer. The shape of the downward leg of the 7 is different on the second generation scopes, independent of the thickness of the lettering. Early and late scopes have a curved leg on the 7. 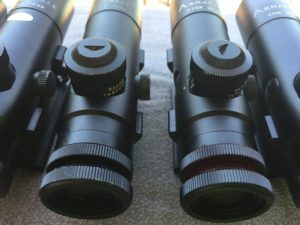 Second gen scopes have straight leg. Sorry, my numismatic past still surfaces from time to time. Next thing you know, I will have my loop out looking for variations. The markings for the bullet drop compensation knob are also different. Not just the meters vs. yards but the spacing and placement of the markings. The knobs are all on the “1 to 2” position. Finally some notes about inspection stickers. 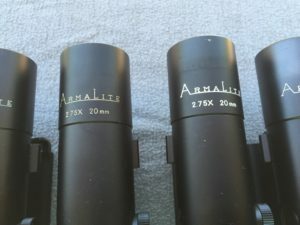 I do not have any on my second gen scopes but there are different ones on the first and third gen scopes. 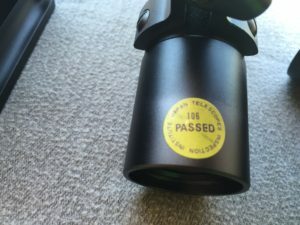 Early sticker is on top front of scope. Still looking for the variation that has a “K” sticker on the windage adjuster cover. I’m not sure yet where that one falls into the mix. Awesome, love the information and photographs. I have an early AR-15 Sporter and Scope and often wondered if there was one or several companies that actually manufactured the scopes. The AR-15 and AR-180 scopes are similarly styled, but of course their means of attachment differs. 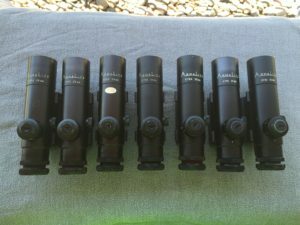 Other than the early “Made in the USA” scopes both Colt and ArmaLite scopes were built by Hakko of Japan. 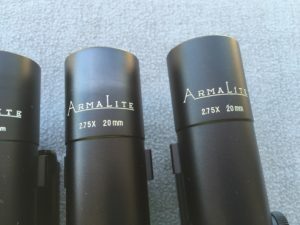 The markings and mounts are the only differences and there are actually some Hybrid scopes running around that have Colt marked scopes with ArmaLite mounts and vice versa. 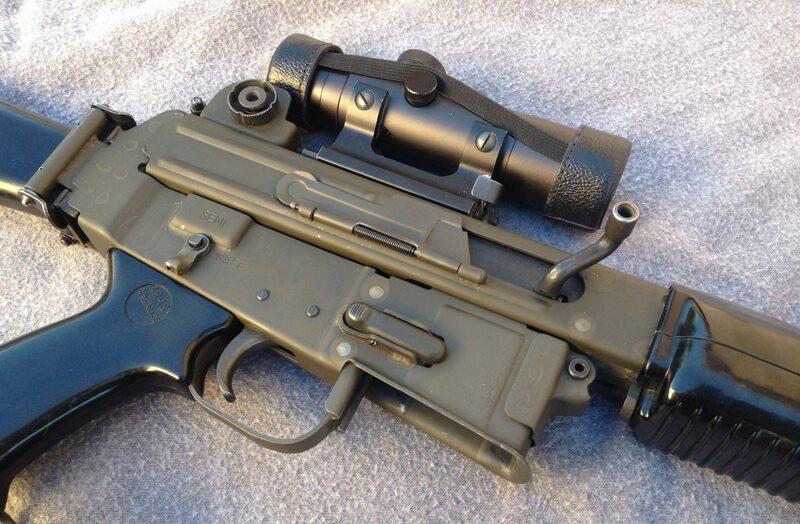 I think a Colt marked scope in a Armalite mount was most likely done by a individual not anything done in production. Very unwise to remove the 4 screws holding mount to scope. Very easy to strip the shallow threads in the aluminum scope body. Most screws show signs of thread locker/sealer. 2 Versions of screws. One a very fine thread, the other less fine. Going into aluminum, Hakko must have at some time switched to the coarser thread for more bite into the soft aluminum. One of the 4 screws has a little post machined on its end to hold a O ring. Thinking Hakko put that screw in last with the scope in some sort of inert gas chamber thereby sealing the gas inside. Just my opinion though from messing with these things for a long time! !